There are numerous tour options that can be included or substituted for suggested features in this tour. Components of our sample tours can be custom combined or revised per your request. Please contact us for more information. 5 Days - 4 Nights - Visit Ripley's Aquarium and Ripley's Believe it or Not Museum. Test your skills at the NASCAR Speed Park. 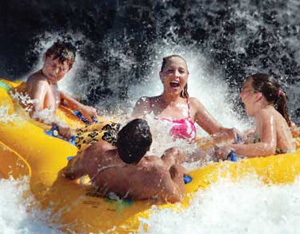 Enjoy yourself at Myrtle Waves Water Park with over 20 acres of swerves, curves, and waves. There's adventure and excitement at Medieval Times. Take a motor coach safari through the low country. Tour a Spanish castle. See rice plantations. Spend free time along the Boardwalk. 4 Days - 3 Nights - Includes WonderWorks, the SkyWheel, Broadway at the Beach, the Beach, Pirate Voyage, Alligator Adventure, Barefoot Landing, Palace Theatre, Hopsewee Plantation, and more.